Kiki Smith is one of her generation’s most influential and richly generative artists. She was part of the artist collective CoLab [Collaborative Projects], whose radical reimaging of the role artists can play in shaping culture and social environments is a model for many artists working today. CoLab helped revitalize the neglected former industrial spaces of lower Manhattan, working with residents left behind by the tumultuous years of New York’s near bankruptcy and the AIDS health crisis. CoLab advocated for new forms of artistic work while advocating for a broad multi-cultural arts community. Smith is also a second wave feminist artist, alongside Barbara Kruger, Laurie Simmons, Kara Walker and Cindy Sherman. She used her own body to comment on social issues, and in the mid-1980s, studied to be an emergency medical technician to know the body’s mechanics better. Smith’s body works, sometimes called “abject”, have an unflinching poignancy and veracity that grapples with decay and mortality. These works suggest the pathology of the body points to the pathology of our culture. In the mid-1990s, Smith turned from the base physicality of the ageing body towards fairy tales and myths, using historical female characters as alter egos of transcendence and transgression. 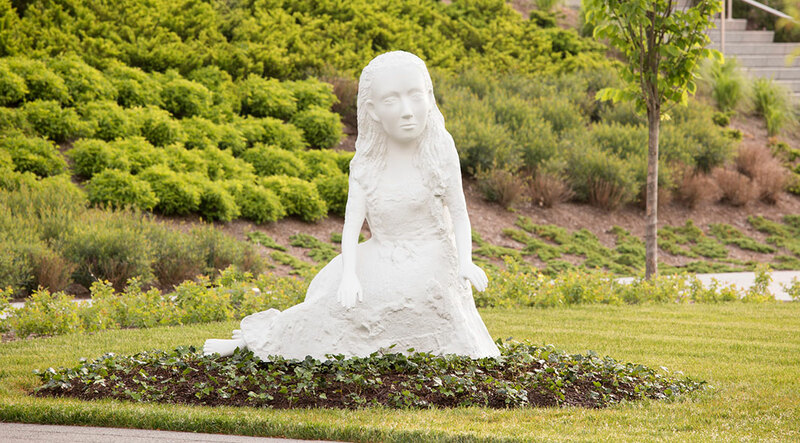 Alice (Seer II), 2005, is part of a broad body of work in sculpture, painting, drawing and prints based on Lewis Carroll’s book of drawings that accompanied Alice’s Adventures Underground (otherwise known as Alice in Wonderland, published 1865). In it, the hierarchy of humans and nature, adults and children is up-ended, the scale of the characters changing to suggest their role in the story. Like Alice in Carroll’s story, Smith’s Alice is enormous for a little girl, perched next to her imaginary pool of tears. Her figure seems otherworldly, haunted by the burden of being. Smith, born in Germany in 1954, is the daughter of artists Tony Smith and opera singer / actress Jane Lawrence. Smith has shown her work in Austria, Canada, France, India, Italy, Japan, Germany, Spain, South Korea, Switzerland, the United Kingdom and the United States. She has had one-person museum exhibitions at the Haus der Kunst, Munich; the Fundació Juan Miró, Barcelona; the Elizabeth A. Sackler Center for Feminist Art, Brooklyn Art Museum; the Museum of Modern Art, New York; the Walker Art Center, Minneapolis; the Whitney Museum of American Art, New York; the Hirshhorn Museum and Sculpture Garden, Washington; and the Irish Museum of Modern Art, Dublin, among many others. Her work was included in the 51st Venice Biennale, 2005 and the Echigo-Tsumari Art Triennial, Nigata, Japan. Her work has been collected by the Whitney Museum of America Art, the Metropolitan Museum of Art and the Museum of Modern Art, New York; the Victoria and Albert Museum, London; the Walker Art Center, Minneapolis; The Tate, London; the Philadelphia Museum of Art; the Museum of Fine Arts, Boston; the Museum Folkwang, Essen, Germany; the Museo Querini Stampalia, Venice; the Moderna Museet, Stockholm; the Israel Museum, Jerusalem; and the Louisiana Museum of Modern Art, Humlebæk, Denmark.